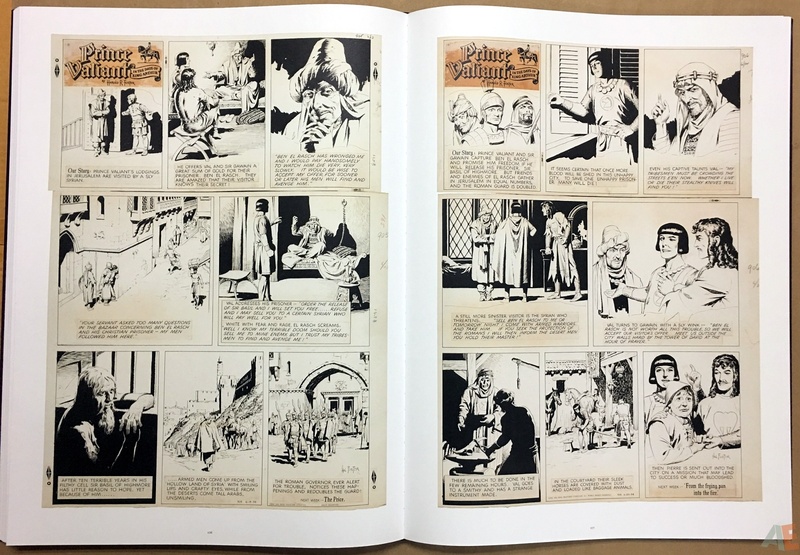 Fantagraphics’ recent reprints of the Prince Valiant strip, scanned from original color engraver’s proof sheets, have received international acclaim, and now we are printing the Holy Grail of comics art. 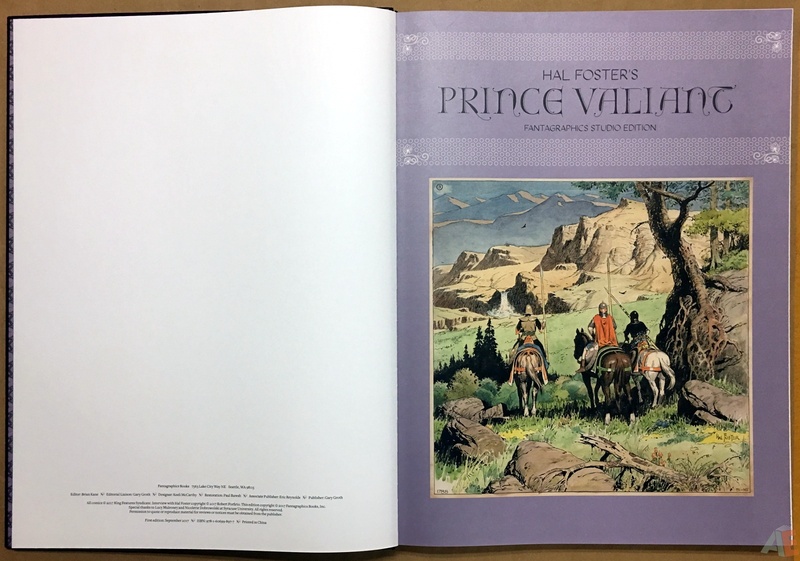 Hal Foster’s Prince Valiant Artist’s Edition is a 192-page collection scanned from Foster’s original pages and printed in full color, capturing every nuance of Foster’s masterly brush strokes. Each page is so rare that the sum total of the original art reprinted in this book would likely cost millions. 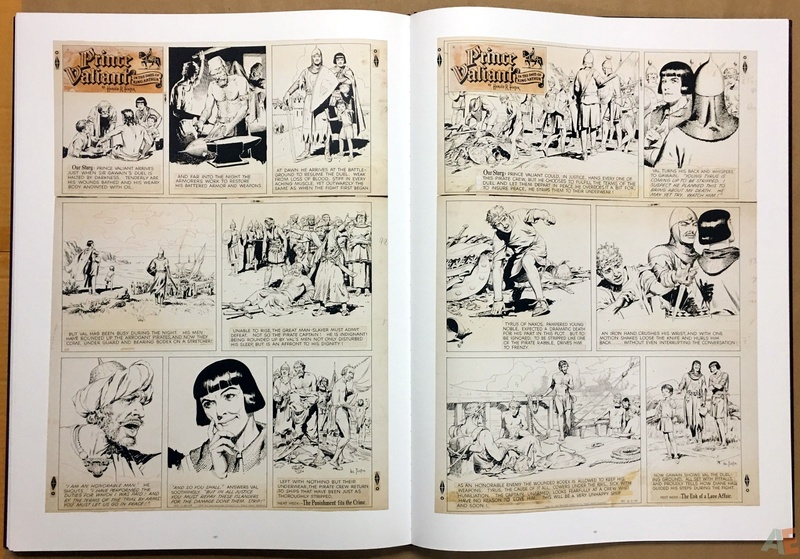 From Foster’s very first Prince Valiant page to his very last the public will be treated to a selection of some of the most iconic and beautiful comic art ever made. 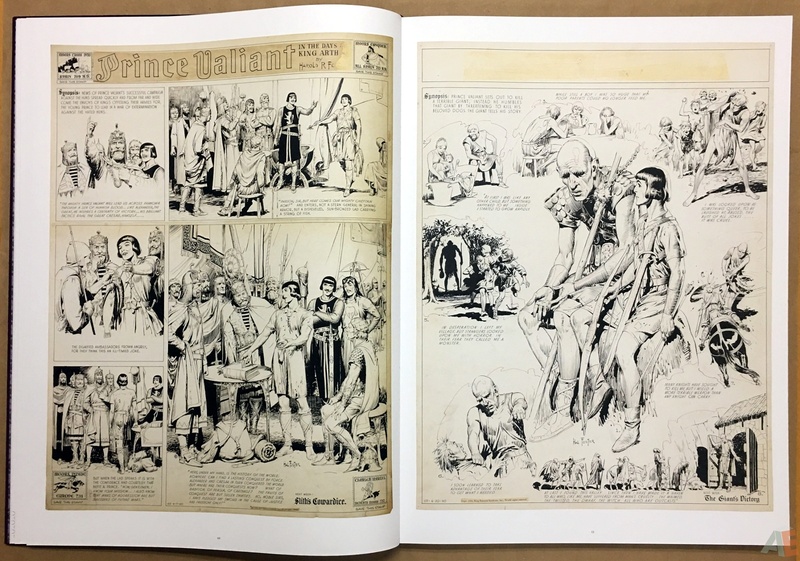 One of the longest delayed and most anticipated of Artist’s Edition style books, Fantagraphics Studio: Hal Foster’s Prince Valiant is the greatest newspaper strip art collection ever. For everyone who ordered this in 2015 and have anxiously pondered this long commitment, your faith is justified. 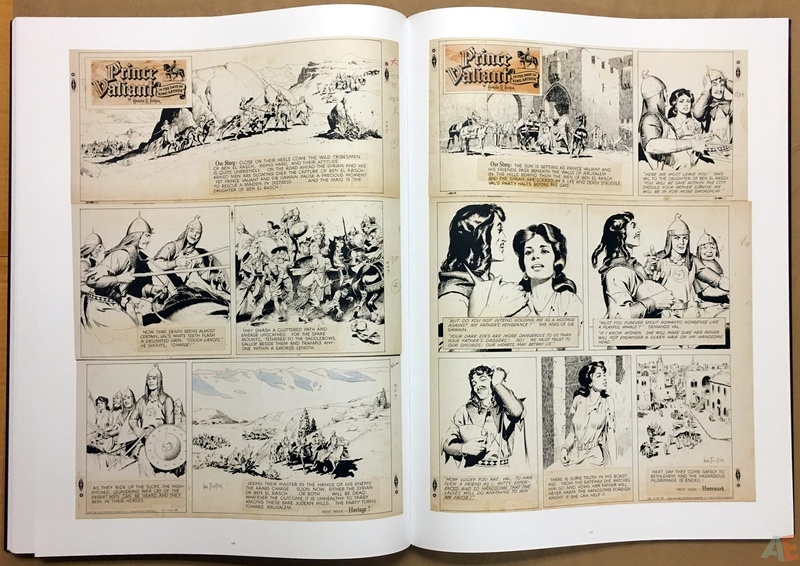 We’re presented with 147 pages of Hal Foster Prince Valiant strips, spanning from 1937 to 1971. Many wonderful and beloved strips included, with a few consecutive runs. 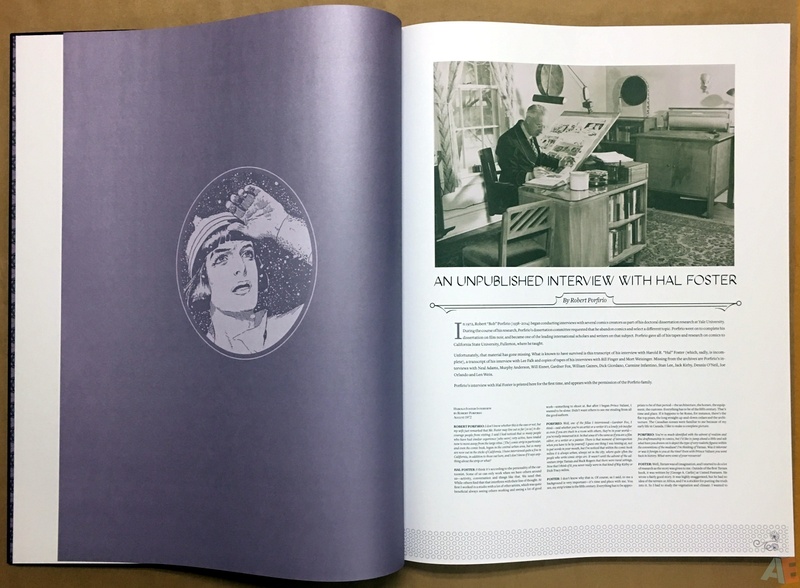 Beginning this volume is a lengthy previously unpublished interview of Foster from 1974. All in all 160 pages on sheer wonder (yes, the publisher’s blurb says 192 pages). Also in the box is a folded print of original art at its full size. Scans are for the most part excellent. 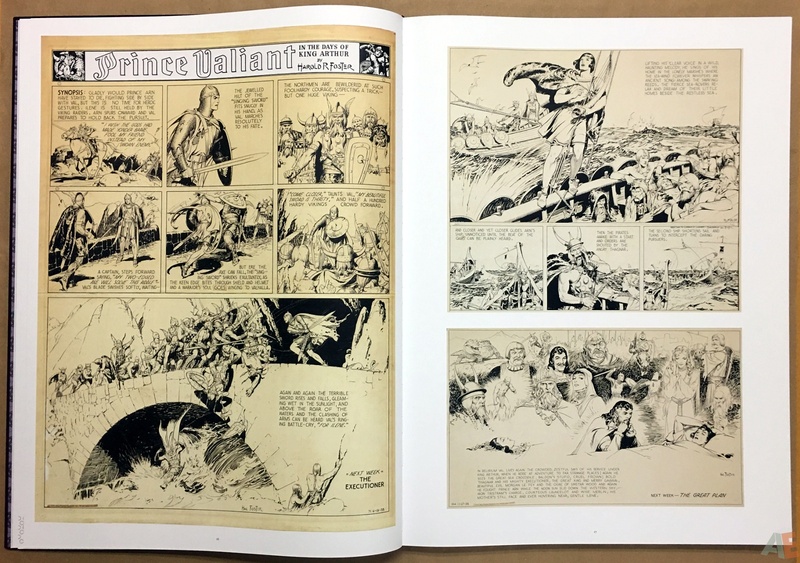 The art has aged very well, with most pages off-white to slight yellowing, and a few tanned. What shows age more is the lettering; it has lightened considerably on the earlier strips. Blacks are consistent, with no gradients. Foster used red ink frequently and it shows well here, as do the paste ins and corrections. 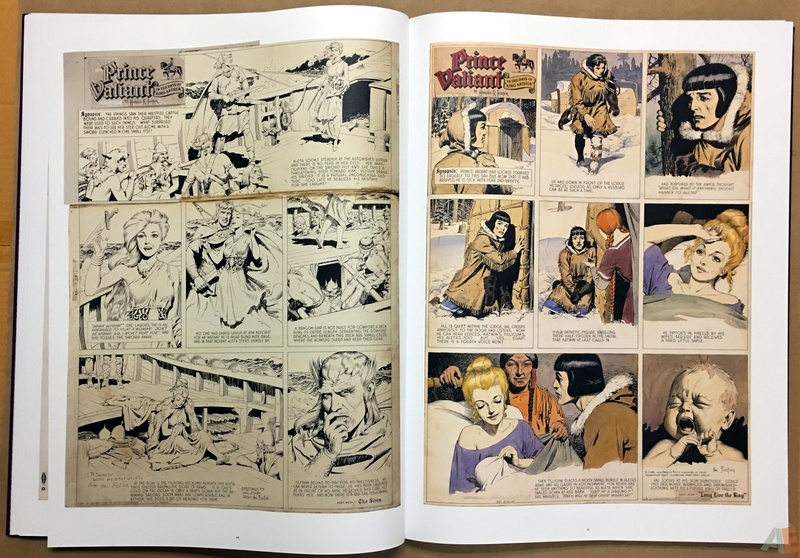 There are two strips included that Foster coloured and they leap off the page. The sewn binding allows most pages to lay flat after smoothing the center. What we’re missing is an editorial note about the book. 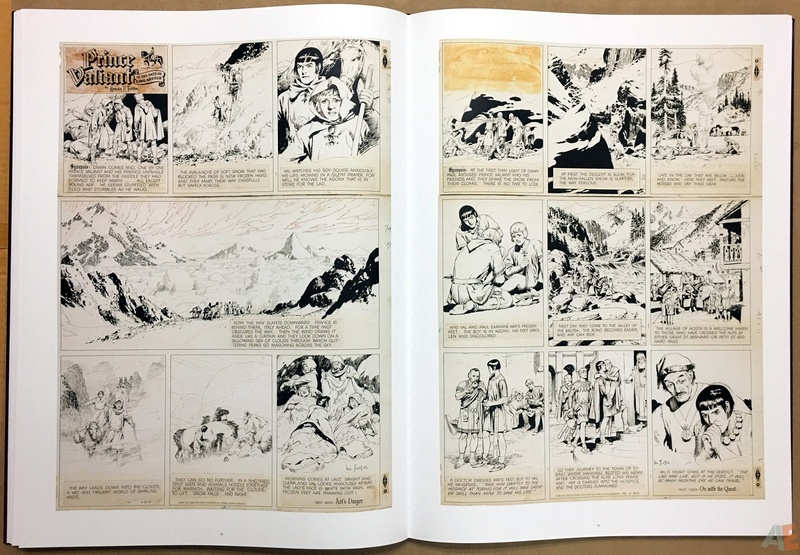 Foster worked very large so all the Sunday strips here have been reduced, which when you’re reading this 17″ x 24″ book seems unbelievable. 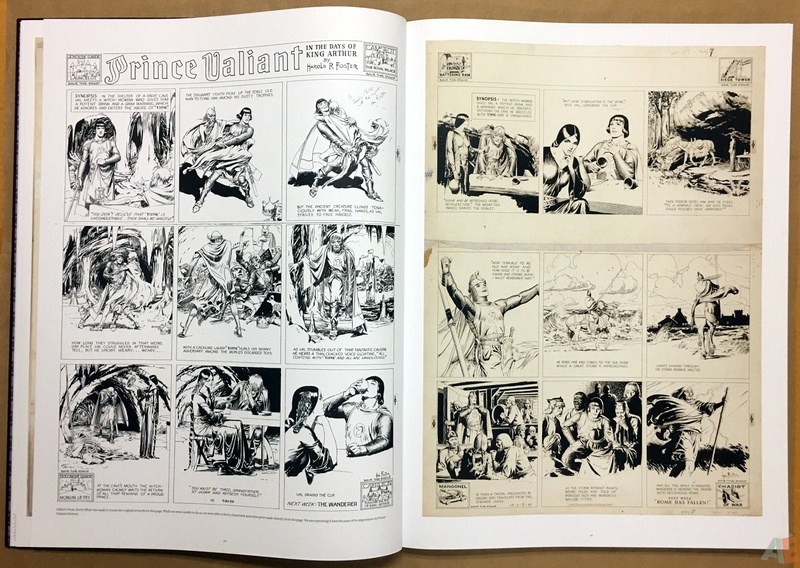 There is one note on a page indicating the original wasn’t available but it’s important to the strip. 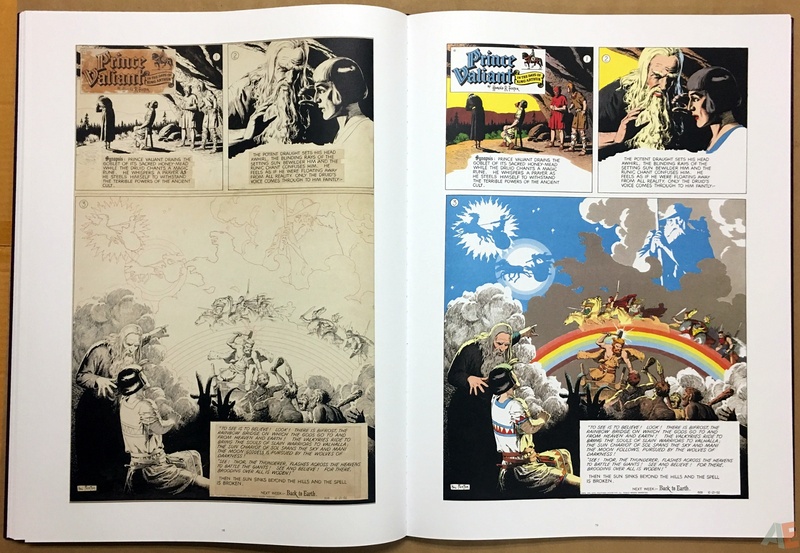 There are colour pages of Sunday strips, not original art, included with no note, so we’re left to determine if it was included for continuity or to show the detail added by colour. 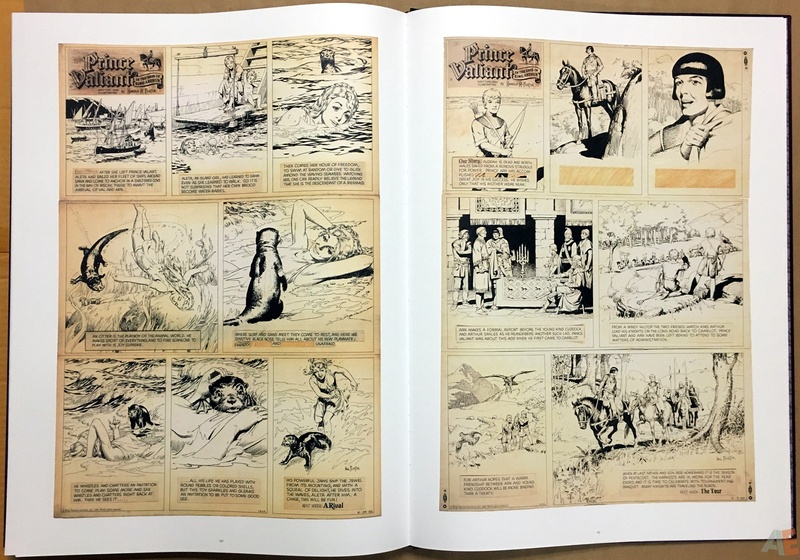 While there are page numbers on most pages, unless the art filled the entire page, there is no index or page notice of strip date like we’d normally see in a newspaper strip collected edition. 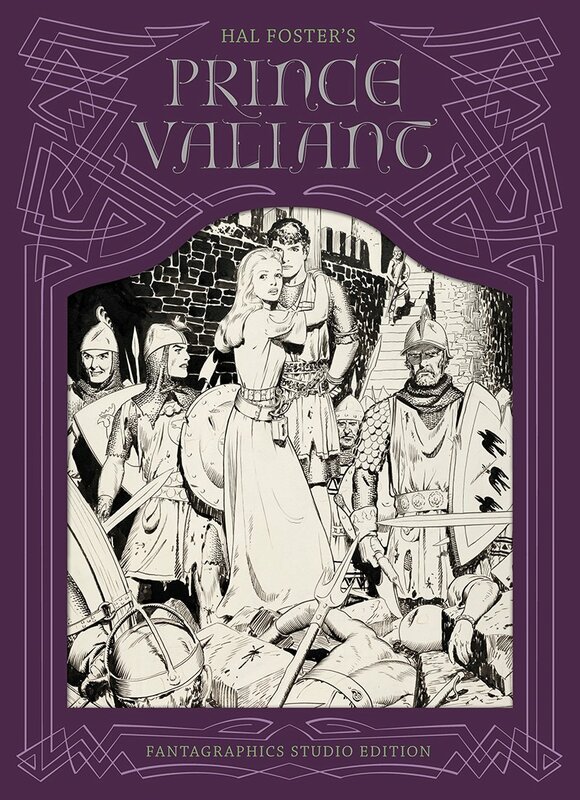 This follows the design of the current Fantagraphics Prince Valiant collection: you need to determine it from the copyright notice. This works in those volumes were two years at a time are collected, but here the span is 34 years. Paul Baresh is credited with restoration, which is interesting in a book of scanned original art. Perhaps his work was on the included pages that are not from original art, or on the lightening of the art of the included print. 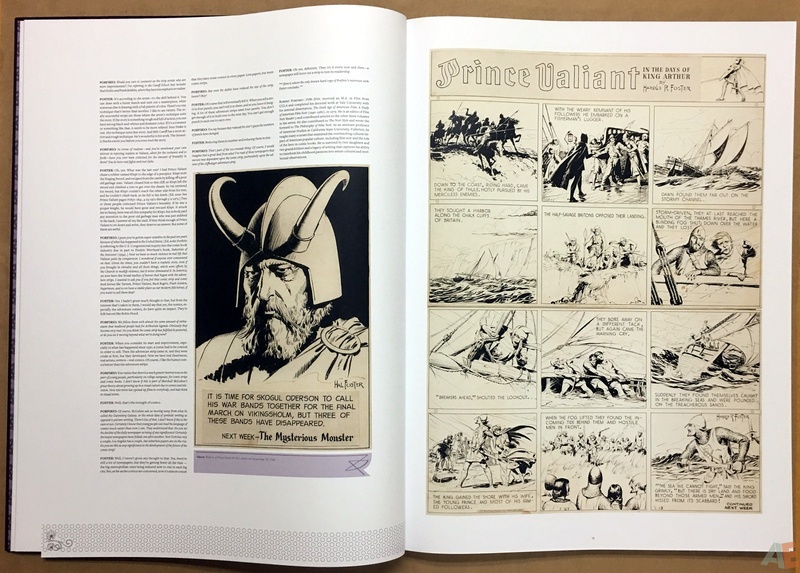 In the image below you can see the included print showing the art at original size and the page in the book, reduced approximately by one-third. 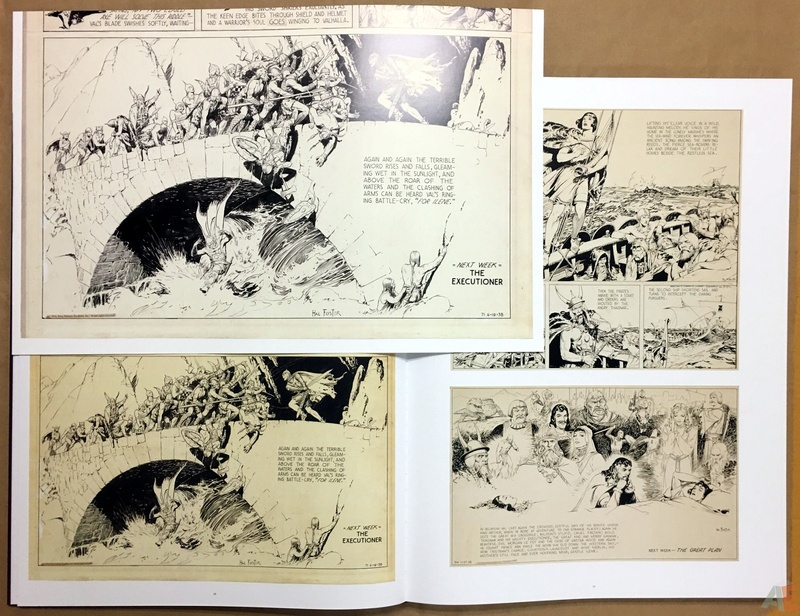 We were debating the book’s production and scanning on the Tapatalk AE forum and Brian Kane was kind enough to provide some answers. Initially Syracuse agreed to have all of their art scanned using a flat bed scanner. So when the original solicitation was published back in 2015, that was our understanding. 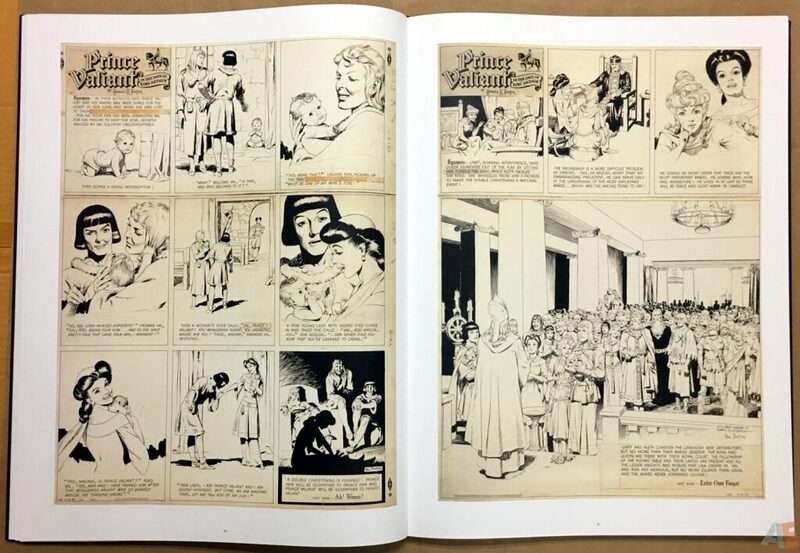 Syracuse had scanned pages in the past (see Prince Valiant, Vol. 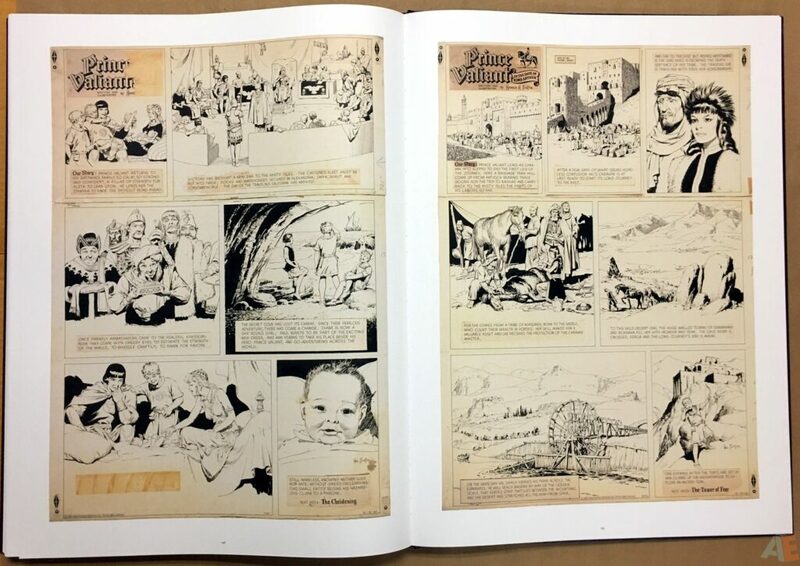 9: 1953-1954 – Mark Schultz’s Introduction), but once the curators got into it they realized some of the pages I had selected were too brittle to flatten. You can see this on pages where the lettering is missing. You flatten it and the glued-on lettering just pops off the page. Not all of the pages were considered too fragile to flatten, but certainly a percentage of them were. This had to do with how they were originally stored by Foster, and how they have been stored by Syracuse. Back in the 1940s-1980s comic art was not respected as it is today. The pages that were deemed too fragile were professionally photographed with a mounted hi-res digital camera. 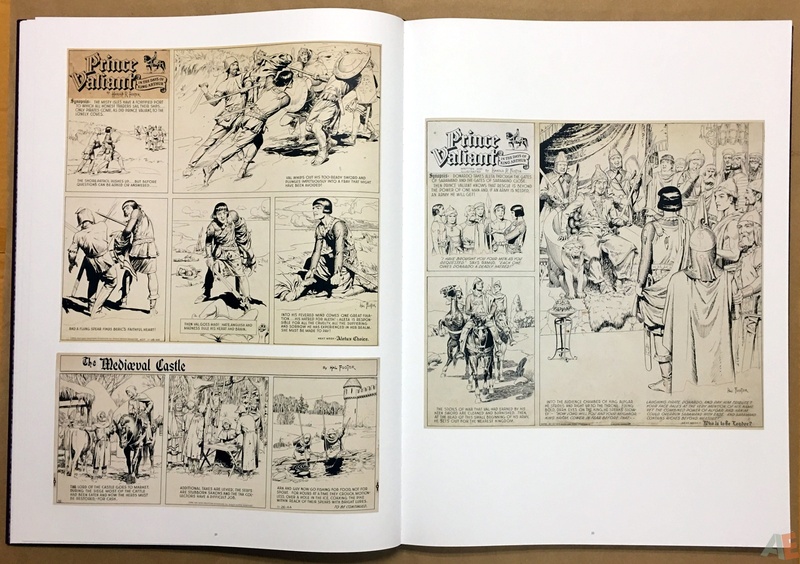 This meant that the photographed pages could only be reproduced at print size, and not at original size. Since it was impossible to print an affordable book at 3′ x 2′ anyway this wasn’t considered a problem. One collector did not have access to a flatbed that could scan at 3×2, so his were professionally photographed. 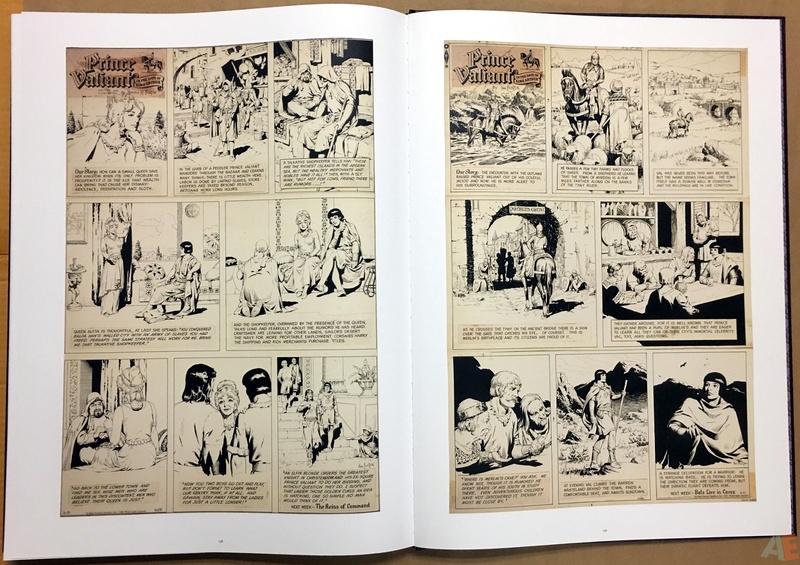 Thankfully, all of the owners of private collections were willing to have their art removed from their frames, and Fantagraphics agreed to pay for them to be reframed. The classic Bridge at Dundorn Glen page, which appears in the book and as a bonus original-sized print, was scanned on a flatbed at 600 ppi. Hope this helps clarify things. Design by Keeli McCarthy is clean, consistent and engaging. 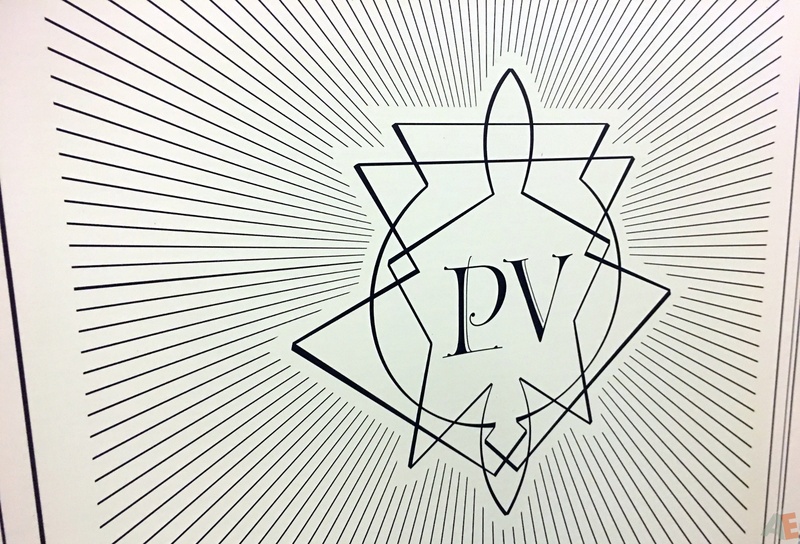 The patterns play on the box, cover, spine and through the title page and interview. End papers are more patterns. I’m not fond of the mauve on the title page but it ties in well to the interview highlights. Production is excellent. There is a fine attention to detail throughout. The die cut cover is a wonderful presentation piece doubles the thickness of the cover. This is the heaviest paper stock I’ve seen or more accurately felt in any Artist’s Edition format book. Sewn binding of this matte paper stock. The books comes in a patterned book box and then in a plain white box with UPC and price. As well the book is in a resealable archival bag instead of the usual shrink wrap. Well done. 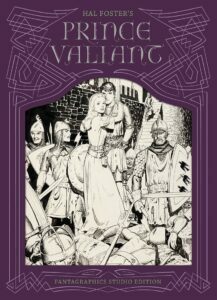 We were also able to gleam print run information from Brian Kane’s comments on Facebook; a number other publishers are unwilling to provide. Only small issues with this work. I found the bottom of the early strips to have a slight softness that presented as minute blurriness. As well the first caption in the interview says “opposite” when referring to a previous page. And the purple cloth covering the head-band gave way on my copy, but a little binding glue corrected that. Very small points that should in no way hold anyone back from purchasing and cherishing this amazing collection.